Tokyo, Japan -- Jodo Shinshu, also known in English as “Shin Buddhism,” is usually identified as the most popular denomination of Buddhism in Japan. Based on the teachings of Shinran (1173-1263), it arose as part of the “New Buddhism” of the Kamakura Period (1185-1333), which included Zen and Nichiren Buddhism as well as other Pure Land sects — the mainstream for Japanese Buddhists. 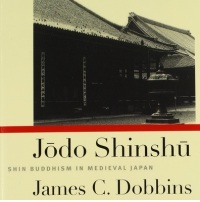 James C. Dobbins’ “Jodo Shinshu” explores the development of Shin Buddhism from its origins as a scattered and often persecuted popular movement into one of the most powerful sects of Buddhism. As with the history of any long-lived organization, there is often wide divergence between contemporary and retrospective understanding of events. Shinran, for example, famously saw himself as only a faithful disciple of his own teacher, Honen (1133-1212), not the founder of a new school of Buddhism. One of the book’s strengths is the way Dobbins takes care to distinguish between evidence and interpretation. Research on Kamakura Buddhism has evolved in the decades since the book was written, as Dobbins himself notes in the introduction to the paperback edition, but “Jodo Shinshu” remains a valuable introduction to a crucial chapter in the history of Japanese religion.